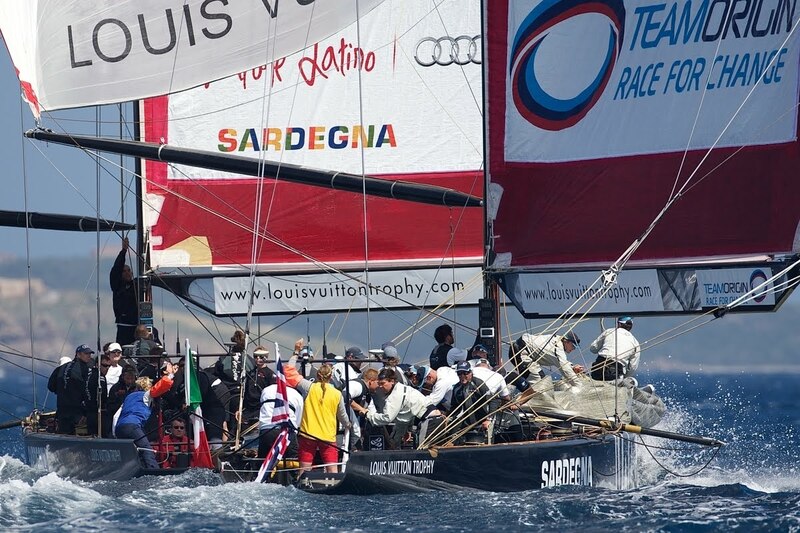 Louis Vuitton Trophy, La Maddalena, Italy, May 22nd-June 6th 2010. Race Day 14. Semi-finals: Artemis (SWE) vs Emirates Team New Zealand (NZL), © Paul Todd/outsideimages.co.nz/Louis Vuitton Trophy. Light winds in La Maddalena, Sardinia, delayed racing in the Louis Vuitton Trophy again today. Emirates Team New Zealand won their first match against Artemis, but then lost the second, forcing a decider, which ETNZ won by 1 min 31 secs. This put ETNZ into the finals. 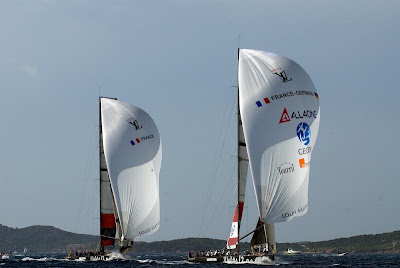 Insufficient wind/time for racing means that it is likely that the racing between Synergy and ALL4ONE for the other place in the finals will take place tomorrow in La Maddalena. There is now less than one week to go before the Mediterranean superyacht racing calendar opens with four days of exhilarating racing on the emerald waters of the Costa Smeralda at the Loro Piana Superyacht Regatta. 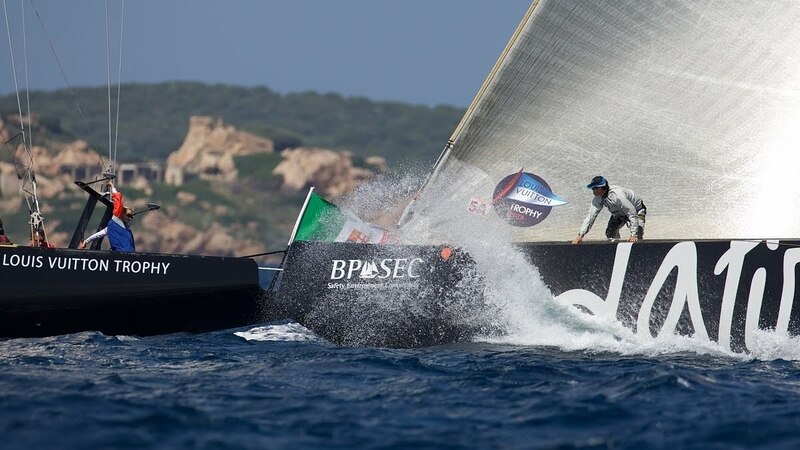 The regatta will take place from 8th to 12th July and is organized by the Yacht Club Costa Smeralda (YCCS) in collaboration with Boat International Media. Following consultation with the participating owners, Edoardo Recchi, Sports Director at YCCS, has split the diverse fleet of 28 yachts into two divisions with the aim of making the competition as exciting and challenging as possible for all involved without compromising the safety of the vessels or crew. The five yachts in the racing division will have a fleet start and the twenty three yachts in the cruising division will start at one minute intervals on a pursuit start. The overall winning yacht of the Loro Piana Superyacht Regatta 2010 will be named on the perpetual Silver Cup which is displayed in the Yacht Club Costa Smeralda and the owner of the vessel will be presented with a unique hand blown glass sculpture by Chihuly made especially for the event reflecting the colours of the Sardinian waters. Special prizes will also be awarded to the overall winning yacht of each division. These will be handmade, polished stainless steel yacht models by the artist John Mellows of Azure Dragon Marine Sculptures. The race will be supported by Feadship's luxurious 39 metre motor yacht GO which will follow the racing as will motor yachts from the Maxi Dolphin and Blue Game boatyards. The Superyacht Cup Palma 2010 is shaping up to be the best yet, with 20 yachts already confirmed for the three days racing and a full social programme of activities for every evening. The regatta, now in its 15th year, has the reputation of being as much fun off the water as on, and this year should be no exception. The ‘pavilion’ on the dock will be the central focus for the evening events starting with the Welcome Cocktail party for all participants and sponsors on Wednesday June 23rd. Thursday evening’s programme includes the Yacht Report Group and MTN Satellite Communications Western Barbecue (fancy dress) while the Spanish Paella and ‘Yacht Hop’ will take place on Friday night. Finally, the Prize-giving Evening will be held at Es Baluard Musuem, set high on the ancient City of Palma’s walls overlooking the harbour and the Bay of Palma on Saturday night. 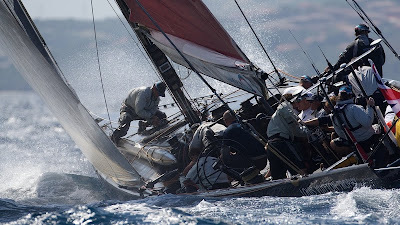 The World Famous Red Sox, who played to the jubilant crowd at The Superyacht Cup in 2007 and again in 2009, will be looking for support from the budding musicians in the fleet. Participating crew (those with musical talent!) 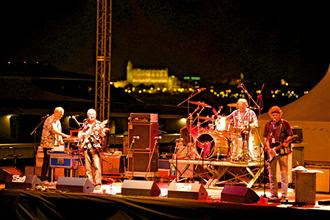 are invited to join the band on stage for a chance to perform with some legendary musicians. Whilst the parties all focus on light-hearted fun, the racing is, as always, competitive; professional Race Officer Peter Craig will be overseeing the setting of race courses, starting procedures and race management. Once the individual ratings have been calculated by Jim Teeters and the start time set for each yacht, the game of ‘catch-up’ - known as Pursuit Racing - begins, where each yacht aims to overtake as many other yachts as possible to cross the finish line first. The most important aspect of this regatta is sailing safely; a safety separation zone of 40m between yachts at all times on the race course is critical to avoid collision and the Superyacht Racing Protocol will be strictly enforced. The Captain/Tactician/Safety Officers Briefings play a very important role, presenting the superyacht racing protocol (racing rules) however, as always, participating within the ‘Spirit of the event’ is the over-riding consideration. Ensuring that the action on the race course can be closely followed, official event supplier J Craft will provide their 12-meter Torpedo powerboat as a VIP spectator boat. J Craft hand builds classically styled, yet inherently modern, luxury powerboats in the best traditions of Swedish boat building. A distinctive style, fine craftsmanship and exquisite materials, coupled with robust engineering and real-world usability make J Craft unique in the marine industry. Ian Williams wins in Bermuda. Supplied image. With the Argo Group Gold Cup final entry deadline looming on June 15, French Match Racing Team Skipper Mathieu Richard and Adam Minoprio of Black Match Racing lead the field of entries. Richard tops the world Match Racing Tour standings while Minoprio is ranked #1 on the ISAF list. Richard won the King Edward VII Gold Cup in 2007. Minoprio has finished in second place twice and hopes to move up in 2010. Other Tour Card holders who have entered are Francesco Bruni (Team Azzura), Bjorn Hansen (Hansen Global Team), Torvar Mirsky (Mirsky Racing Team), Bertrand Pace (Aleph Sailing Team), and 2006 Gold cup winner Ian Williams (Sail Bahrain). In addition to card holders a group of sailors ranked high by both ISAF and the WMRT and some who are active America’s Cup or the Louis Vitton Series were invited. Those skippers who have accepted to date include Dean Barker (Emirates Team New Zealand), Johnie Berntsson (Berntsson sailing Team), Gavin Brady (Royal Hong Cong YC), Paolo Cian (Team Italia), and Damian Iehl (French Match Racing Team). The skippers who have applied for an invitation have been advised that a selection committee will review all applications and select the teams to complete 21 of the 24-team field on June 18th. The remaining three entries will go to the winners of three qualifier events, the Knickerbocker Cup, the Detroit Cup and the Bermuda National Match Racing Championship. 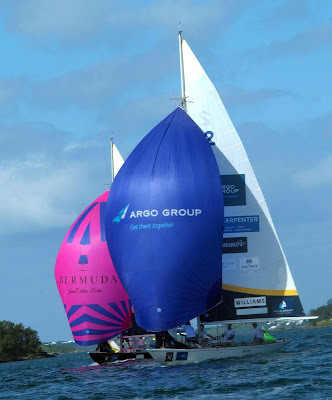 The Argo Group Gold Cup is the penultimate event of the ten-stage World Match Racing Tour. Argo Group International Holdings, Ltd, an international underwriter of specialty insurance and reinsurance products in niche areas of the property and casualty market, returns as title sponsor for the third year. In addition to Argo Group, key sponsors include The Bermuda Department of Tourism as official host, Renaissance Re, Guy Carpenter, and AON. The Hamilton Princess Hotel is offering special packages for Argo Group Gold Cup Week. Renaissance Re will once again sponsor the Renaissance Re Junior Gold Cup International Optimist Dinghy regatta sailed in Bermuda’s Great Sound and Hamilton Harbour. The Argo Group Gold Cup, sailed for the King Edward VII Gold Cup, is now stage 9 of the World Match Race Tour, the ISAF match-racing world championship. The Bermuda classic is the oldest match-racing competition in the world for one-design yachts. The trophy presented to the winning team was originally given at the Tri-Centenary Regatta at Jamestown, Virginia, in 1907 by King Edward VII in commemoration of the 300th Anniversary of the first permanent settlement in America. C. Sherman Hoyt, a renowned American sailor, won the regatta and was presented with this now historic cup. Through the years Bermuda has won the Cup 21 times, the United States 17 times, New Zealand 10 times, Australia 5 times, the United Kingdom 4 times, and in 2002 Denmark claimed the King Edward VII Gold Cup for the first time. 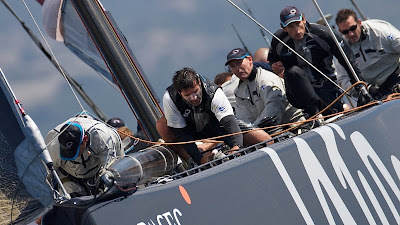 The 2006 winner was Ian Williams (UK) who defeated a fleet including the 2005 winner, Luna Rosa Skipper James Spithill, who in that year had shut out Russell Coutts’ incredible string of wins. Mathieu Richard of France became the third consecutive first-time winner of the King Edward VII Gold Cup in 2007. In 2008 the cup went to Sweden’s Johnie Berntsson and his Berntsson Racing Team in the final 3-1 victory over Adam Minoprio’s Emirates Team New Zealand/BlackMatch Team. In 2009, Team Origin skipper Ben Ainslie etched his name on the coveted Gold Cup. The Argo Group Gold Cup is the 9th out of 10 events on the 2010 World Match Race Tour’s World Championship schedule. It is sailed in Hamilton Harbour adjacent to the Royal Bermuda Yacht Club. The venue brings world-class match racing close to shore where spectators can easily see the competition. 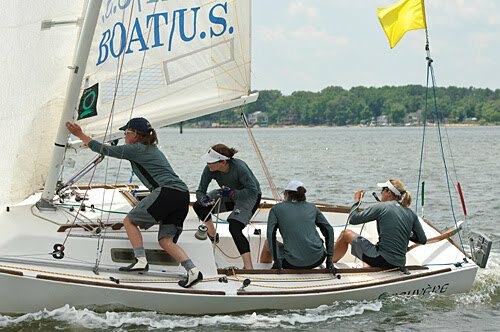 The 24 invited crews include nine official “World Tour Card” teams and three winners of qualifying events, the Knickerbocker Cup, the Detroit Cup and the Bermuda National Match Race Championship. Teams will be divided into three groups of 8 to sail a round robin elimination series Tuesday, Wednesday and Thursday. The leading 8 skippers go on to the Quarter and Semi Finals, to be sailed on Friday and Saturday respectively. The Finals take place on Sunday with the top two teams in a ‘first to three points’ head to head battle and the losing semi finalists in a ‘first to two points’ Petite Final. Between the second and third races, the course is taken over for the final race of the Renaissance Re Junior Gold Cup, which will have been underway simultaneously since Thursday in the Great Sound. The King Edward VII Gold Cup was a founding member of the World Match Racing Tour. The tour is a ten-race series of premier international match race events. It has extensive television coverage and worldwide promotion reaching more than 600 million households in excess of 100 countries. Synergy vs. Mascalzone Latino Audi Team. Supplied image. The last race of the Round Robin saw Mascalzone Latino Audi Team face Emirates Team New Zealand, the “Latin Rascals” weren’t able to overcome the kiwis, finishing fourth at the leaderboard of the qualification series. In the following races of the quarterfinals Mascalzone Latino Audi Team sailed against Russia’s Synergy, fifth overall in the RR that fought for, and obtained, their spot in the semifinals at the expense of Mascalzone. The last race of the Round Robin as decided on the starting line that Gavin Brady crosses slightly ahead of time, thus having to go back and recross. It would be impossible to recover that initial deficit and Mascalzone Latino would lose the opportunity to finish second overall in the Round Robin. They would therefore have to fight for their berth in the semifinals in a best-of-three series against Synergy. In the first match Mascalzone Latino Audi Team doesn’t commit any mistakes, goes off on starboard tack, neck and neck with Karol Jablonski, who nevertheless manages to stretch and build an advantage impossible to reduce by Mascalzone, despite sailing concentrated and attentive to the Russian adversary. Synergy takes the win and holds the match ball for the following race. The second race starts at 5:40pm, after a long wait for the breeze to settle. The breeze blows at 15 knots. During the prestart and after a spectacular passage by Mascalzone Latino Audi Team through the spectator fleet, the two yachts cross the finish line side by side. Mascalzone Latino Audi Team defends the right side of the course under the tacking duels that Synergy, in vain, throws at them in an effort to break their hold. Mascalzone Latino Audi Team rounds the weather mark with a 21-second advantage, the same lead they hold at the leeward gate. Mascalzone will maintain their lead and cross the finish line 33 seconds ahead of their adversary. One all. The decisive race started at 7pm, after the committee changed the race course due to the dying breeze. Gavin Brady’s start wasn’t one of his best and conditioned the outcome of the race. A significant wind shift to the left strips Vincenzo Onorato’s from any possibility to recover, despite the continuous attacks. 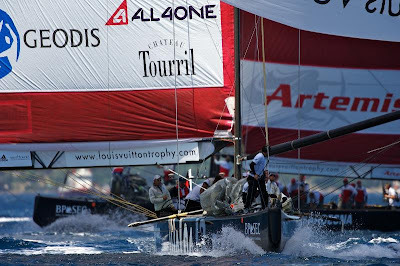 Unfortunately, the schedule of the Louis Vuitton Trophy was heavily conditioned by the weather (winds either too strong or too light) and the collision between the two American yachts: these two factors obliged the Race Committee to force certain parts of the schedule, such as today’s, when races were held in conditions far from perfect. “Today we can’t say we had our best day – stated the skipper Gavin Brady – but the most important thing is the team remained united, nobody got angry with anyone else, we have all learned and we have all grown now , and even if our result wasn’t as good as in Auckland, I’m sure next time we’ll do better”. Three quarter final matches of the Louis Vuitton Trophy regatta were called off on Thursday when the regatta ran out of time and dusk descended on La Maddalena. Emirates Team New Zealand and Azzurra transferred to the race yachts for their quarter-final encounter just before 8pm. At 8.35 the quarter-final was abandoned as time had run out. The sun was setting behind the town and the light was fading fast. Time had run out for the quarter-finals. The regatta sailing instructions stipulated that the quarter-finals had to be completed on Thursday. Earlier the Mascalzone Latino and Synergy quarter-final was completed with Synergy winning the best-of-three encounter 2-1. The three top qualifiers in the round robins - All4One, Artemis and Emirates team New Zealand - join Synergy in the semi-finals which will be sailed tomorrow. Emirates Team New Zealand won its last race of the round robin with a solid 1.05 win over Mascalzone Latino. 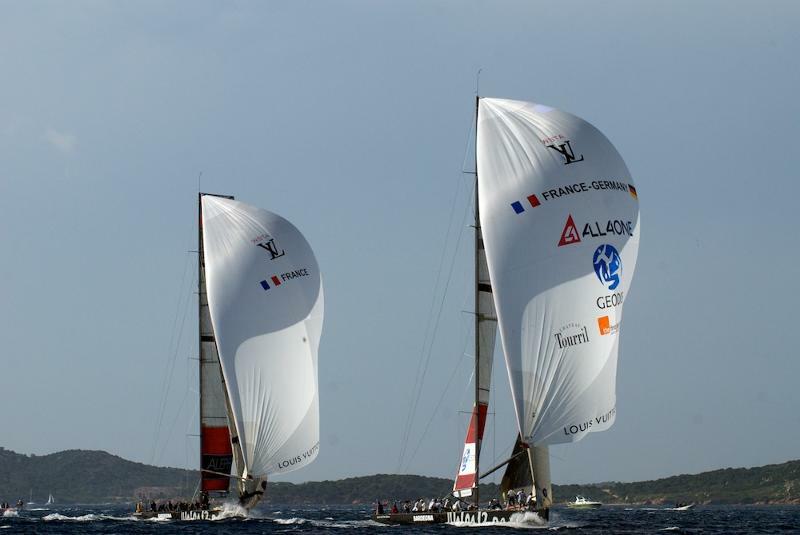 Like many matches on the short courses at La Maddalena, the race was won in the pre-start. Bowman Jeremy Lomas and navigator Jules Salter called the timing to the start line with absolute precision. Dean Barker was going for the pin end with Mascalzone Latino just to windward; the Italians were a little ahead. Barker gave them nowhere to and they were forced over the start line early and had to return. That was it. Emirates Tem New Zealand powered up the beat, rounding the mark 55s ahead. At the leeward mark the margin was 1.04, the third mark 1m and at the finish 1.05. Emirates Team New Zealand finished the round robin on six points, with a 6 win, 3 loss record. Artemis and All4One now race the last round robin match of the regatta. Delta Lloyd will be name giving sponsor for the IFDS Worlds 2010. Preparations for the World championship Disabled Sailing 2010, which will be held in Medemblik, the Netherlands from 6 – 14 July 2010, are in full swing. The Worlds are qualifiers for the 2012 Paralympics and will be sailed on fresh, non-tidal water. The International Foundation for Disabled Sailing (IFDS) has found an enthusiastic organizing body in the Royal Netherlands Yacht Club (KNZ&RV). The Race Management Committee and the Housing Committee are busy planning races, accommodation and catering. On the water as well ashore they are being supported by a team of 90 volunteers, as more than 130 sailors from all over the world are expected to participate. Which, together with coaches, means providing facilities for some 300 people. Meanwhile IFDS has received entries from amongst others Malaysia, USA, Canada, Croatia, Austria, Germany, UK, Greece, Israel, Italy, Ireland, Norway, Australia....and of course the Netherlands. 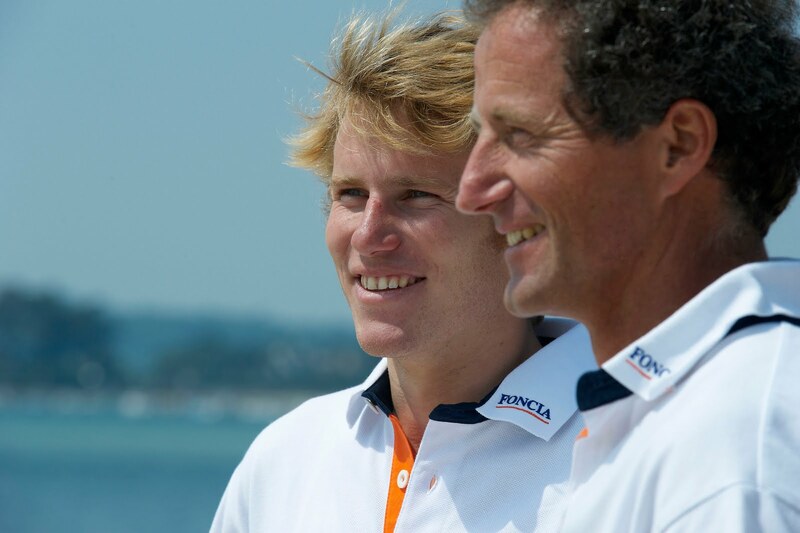 The Dutch sailors are promising, as they were already successful in Southern France, Hyeres, in April during the fourth ISAF World Cup Sailing. 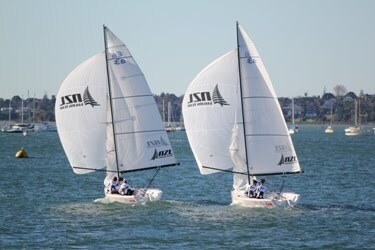 Last week many 2.4mR sailors have participated in the Delta Lloyd regatta, sub-division of the ISAF World Cup for Olympic and Paralympics classes, just as to get used to the water, in order to be well prepared for IFDS Worlds 2010. IFDS proudly presents Delta Lloyd as name giving sponsor. Delta Lloyd, leading sponsor of many sailing events, will guarantee an all-out sportive event, accompanied by festivities ashore. Veteran sailors Colin Couper and Paul Hubbard will be back to defend their respective class and divisional Newport to Bermuda Race titles this year. The pair are among the five Bermuda skippers that have registered for this month’s biennial 635 nautical mile ocean crossing from Newport, Rhode Island to St. David’s Head Bermuda. During the previous race, Couper navigated his Swan 46, Babe, to first place in Class 3 in the St. David’s Lighthouse Division on a corrected time of 63 hours, three minutes and 41 seconds. Hubbard claimed top honours in the Cruiser Division with first in class and first in the division after steering his Oyster 435, fittingly dubbed Bermuda Oyster, across the finish line on a corrected time of 82 hours, eight minutes and 21 seconds. Peter Shrubb, commodore of race co-hosts Royal Bermuda Yacht Club, has high expectations for this year’s local fleet that also boasts “seasoned” skippers Steven Sherwin, Buddy Rego and Mark Watson. He said: “We are looking for big things from these guys this year. All of the Bermuda boats have all done well in this race numerous times. In all, Bermuda could be represented by as many as 40 sailors in this year’s race that gets underway June 18. The Newport to Bermuda Race was inaugurated in 1906 for amateur sailors in normal yachts. Since then professional sailors such as Mike Sanderson have competed in the century old race aboard multi-million dollar designs. 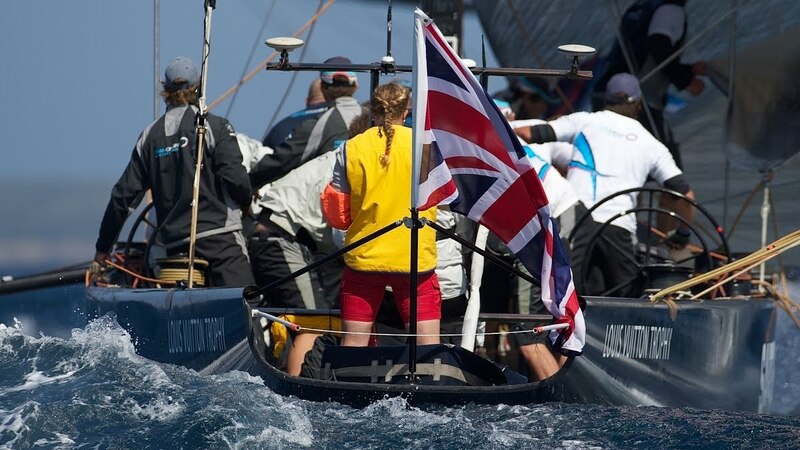 Sanderson, a past ISAF World Sailor of the Year and Volvo Ocean Race winner, navigated Alex Jackson’s 98 foot Super Maxi, Speedboat, to overall line honours during the previous Newport to Bermuda Race on a corrected time of 64 hours, 42 minutes and 56 seconds. 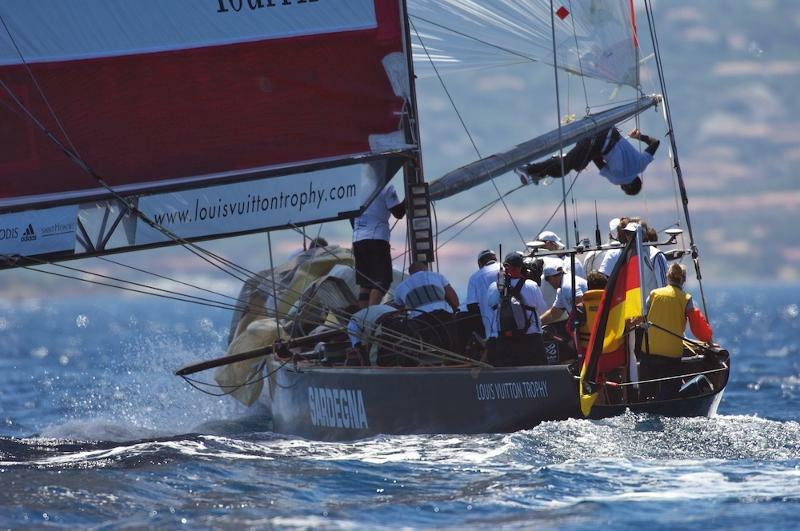 The state–of-the-art Super Maxi will again compete in the Open Division this year. 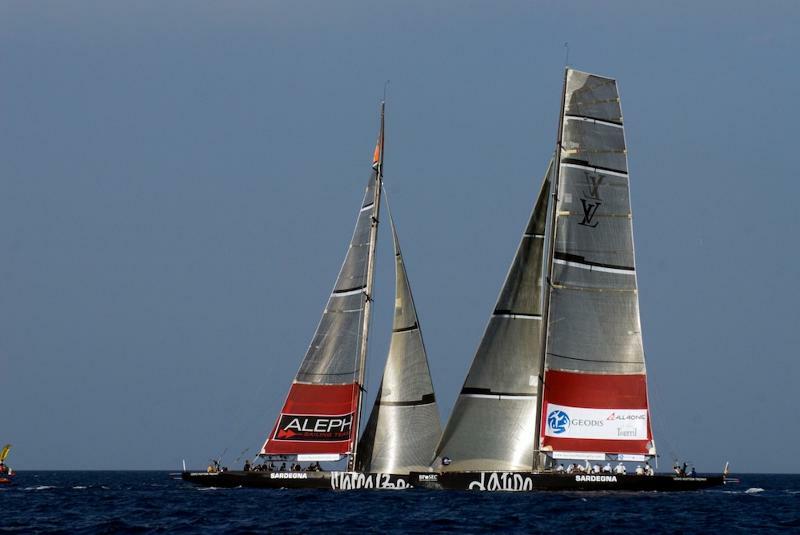 Despite tough economic times, nearly 200 yachts have registered for the bienial sailing spectacle. Since its inception the Newport Bermuda Race has pumped millions of dollars into Bermuda's local economy. “It has been calculated that the race brings in ten million dollars and about six thousand visitors to the island which says a lot for the race and what it does for the economy,” Shrubb added. Among the local dignitaries that could travel to Newport for the start of the race are Premier Dr. Ewart Brown and Governor Sir Richard Gozney. 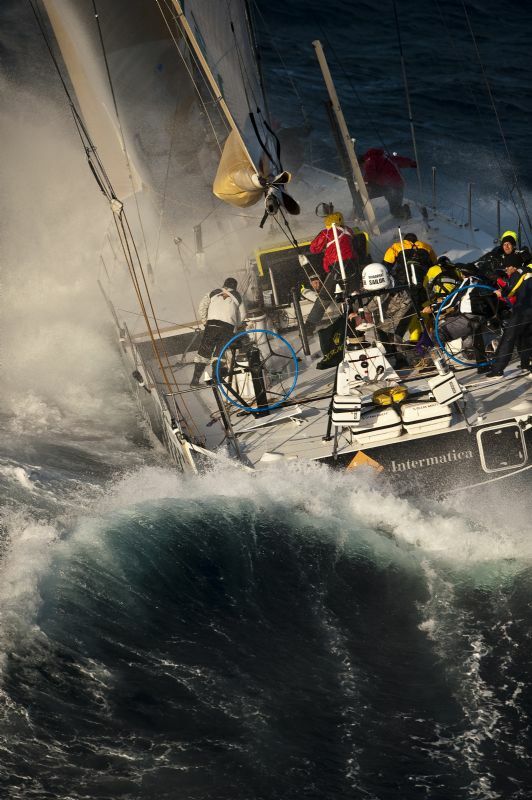 Two of the local yachts in this year’s race, Vanquish and Genuine Risk, have been chartered from the U.S. Merchant Marine Academy and will be helmed by Rego and Watson. It was another hot day on the Chesapeake today for the second day of racing at the Boat US Santa Maria Cup. Our team finished today with a 10-1 record to be on top at the end of the day. Right behind us are Sally Barkow and Genny Tulloch from the USA and Claire Leroy from France. The wind took a while to fill in this morning as the north westerly gradient fought hard to come in. Eventually, it gave in to the sea breeze and we moved the race course out towards the mouth of the Severn River. The breeze filled in nicely to about 13kts and racing got underway. Later in the day, a line of storms came through to the south of us and made the wind go a bit funny, but the race committee did a great job of adjusting for it and keeping the races going. But eventually, the storms won out as the next line approached and we were forced to return to shore. We had some great races today against the top seeded teams. Our loss of the day went to Sally, and it was a silly mistake by me. We were over the line early at the start and had to return which put us quite a bit behind. Despite sailing fast and catching up to about three boat lengths behind, we ran out of race course and it wasn't quite enough. Our closest race of the day was against Claire. We led all the way around the course, but she was never more than a boat length or two behind. Tomorrow morning we will continue round robin racing to complete the second round. From there the semi final teams will be decided and if there is time, we may start racing the semi's tomorrow afternoon. Michel Desjoyeaux and François Gabart. Image © Yvan Zedda / Team FONCIA. "If you’re looking for someone for next winter..."
"When I learnt that Michel was preparing for a new Imoca project and having a brand new boat built for the Route du Rhum and then the Barcelona World Race, I got in touch straightaway. Barely an hour after his press conference in Paris (21st January 2010), I sent him a message. I said to him: if you’re looking for someone for next winter, I’m up for it. He took note. However, I wasn’t the only one to put myself forward" says François, who learnt the good news on 18th May 2010. "Opting for François was practically a done deal in my head since February, but I was concentrating on the construction of the boat and I wanted the project to mature. I discussed it with Christian Le Pape, our coach from Port-La-Forêt and together we concluded that this was the right choice" explains Michel. Michel Desjoyeaux and François Gabart with the hull of their new boat. Image © Yvan Zedda / Team FONCIA. The two guys met in the winter of 2007/2008 when François settled in the nearby Forêt Fouesnant, NW Brittany, and won the Challenge Espoir Région Bretagne. Since then they’ve rubbed shoulders with each other, but had never sailed together until recently, during the Grand Prix de Douarnenez. 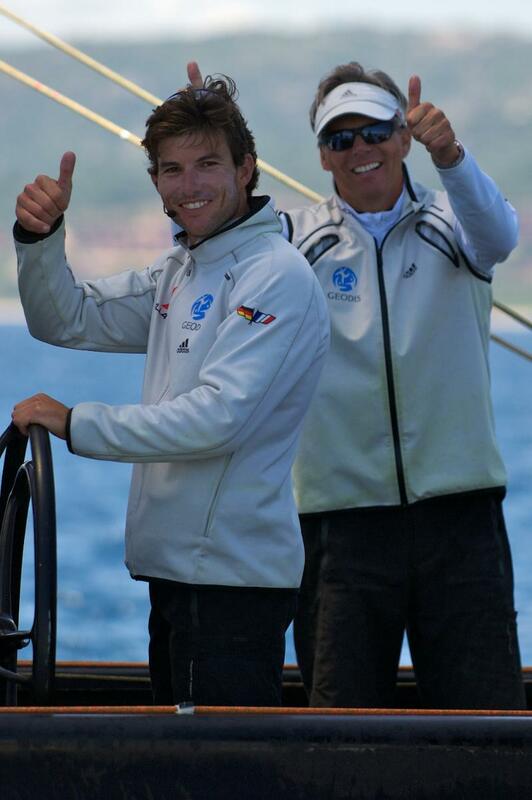 This association is the union between two solo racers, two Figaro sailors and, practically, two generations. Michel Desjoyeaux (44 yrs) has always liked the role of passing on knowledge and is very quick to help the more promising talents get a step up the ladder. 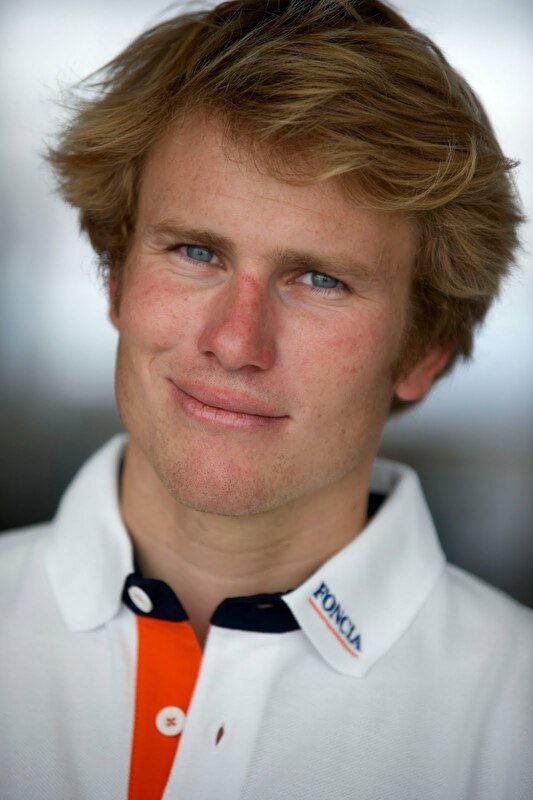 François Gabart (27 yrs) is one such talent: a young engineer with a real gift for racing, who enjoyed his first successes in dinghy sailing, prior to making a swift rise in the Figaro scene. 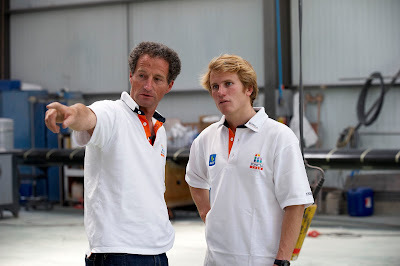 Today he is the "Skipper Macif" with a Figaro programme lined up until 2011, which he will continue in conjunction with his preparation for the Barcelona World Race. The sports calendar which awaits him over the coming 18 months is going to be an extremely busy one then, but this is further galvanising his enthusiasm: “The desire to go around the world on these big boats has been consuming me for the past year so I’m ecstatic about this. Doing the Barcelona World Race with Michel Desjoyeaux, on a new boat as well, is exceptional for me. I think it would be hard to beat this!" When you ask him the reasoning behind his decision, given that it might have been more comfortable to set out with a more experienced co-skipper, Michel isn’t short of arguments: "for his youth, his freshness, his intellectual capacities and his constant desire to try to understand things. He’s a sailor as well as an engineer. He’s never done a round the world, but I think he’s someone who pulls you upwards. It’s not just his potential which is appealing, it’s also his mindset. He has another culture, another view of things and it’s also a way for me not to get stuck in routine". Despite his round the world experience, it certainly won’t be an opportunity for Michel to play the schoolmaster role, quite the contrary in fact: "I’m counting on him to conserve his free will and be pushy. It would be of absolutely no appeal to me if he were to come along and play the yes-man and do the sheeting in whenever the telltales jiggle!" This announcement coincides with the arrival in Port-La-Forêt of the new 60 footer, FONCIA, from Lymington (UK) where she was being manufactured at Green Marine. The construction is progressing well and the assembly of the FONCIA jigsaw will continue at CDK Technologies until late August, at which point she is due to be launched. Michel Desjoyeaux is still very much involved in this task and intends to delegate part of the work to his co-skipper. "I’m not going to ask him to tighten the bolts, it’s not his thing. However, I am going to entrust him with every aspect of preparing the tooling for managing and analysing the boat’s performance". Quite a busy schedule in store then. François Gabart. Image © Yvan Zedda / Team FONCIA. After having finished first of the Round Robin yesterday, ALL4ONE will now race the semi-finals of the Louis Vuitton Trophy-La Maddalena! It is the first time that the French-German team reaches this stage of the competition, after having finished 5th of both Louis Vuitton Trophy-Nice and Louis Vuitton Trophy-Auckland. Anything is possible from now on. ALL4ONE will race Russian team Synergy. Emirates Team New Zealand will face Artemis in the other semi-final. The first team to win two races advances to the final. Match races over the next three days in Version 5 America’s Cup boats off the Sardinian island of La Maddalena will determine the outcome of the two-week series. 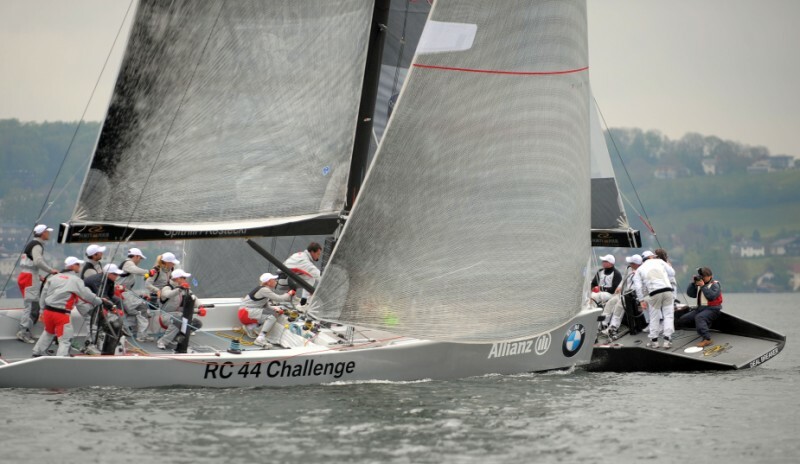 Tomorrow, Artemis will meet Team New Zealand and All4One will race SYNERGY. One quarter-final was decided today. Fifth-placed SYNERGY defeated fourth-placed Mascalzone Latino two races to one. The only races sailed in the shifty northwest breeze were the last two of the round robin and those of the single quarter-final. The remaining three boats went through to the semi-finals based on their performances in the round robin. All4One, in fourth place on Tuesday, won the round robin today, after defeating Sweden’s Artemis which had led on points throughout the week. The Swedish boat finished the round second. Emirates Team New Zealand finished the round third after defeating Mascalzone Latino today. Race Day 13. Artemis (SWE) vs ALL4ONE (GER), © Bob Grieser/outsideimages.co.nz/Louis Vuitton Trophy. All4One, a new team this season, finished the round with a 6-3 record, winning their last four races, handing defeats to top-seeds Artemis and Emirates Team New Zealand in the process. Race Day 13. Emirates Team New Zealand (NZL) vs Mascalzone Latino Audi Team (ITA), © Bob Grieser/outsideimages.co.nz/Louis Vuitton Trophy. It was only four metres, and it was the race! Mascalzone Latino was over the line early and skipper Gavin Brady’s race against the Kiwi boat steered by Dean Barker was effectively over. Brady tacked and ducked back but after he restarted on port tack, ETNZ was already 200 metres ahead and covering in the 15 knot northwester. Before the gun, the pin end was favored and the boats approached it on starboard at speed with the Italians to weather. “Our timing was perfect and they were bow out and pushed over,” said Ray Davies, the Kiwi tactician. The margin was nearly 300 metres at the first mark and at the finish. Race Day 13. 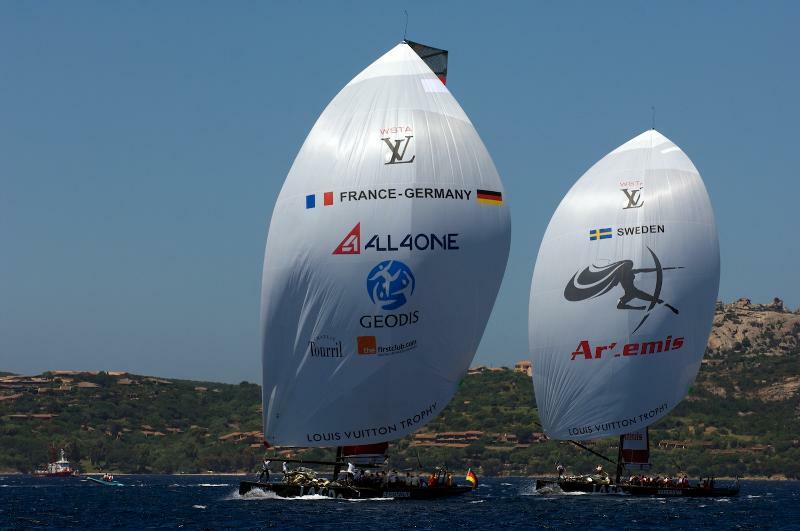 ALL4ONE (GER) vs Artemis (SWE), © Bob Grieser/outsideimages.co.nz/Louis Vuitton Trophy. Karol Jablonski jumped the Russian boat out to a small edge as both boats hit the line at speed right on the gun. Gavin Brady had Mascalzone Latino up next to the committee while Jablonski was midline. Brady sailed his opponent out beyond the port layline in a single tack but SYNERGY slowly lifted up on the Italian boat and was ahead when they tacked. The Russians were ahead by 16 seconds at the top mark and extended from there. Race Day 13. 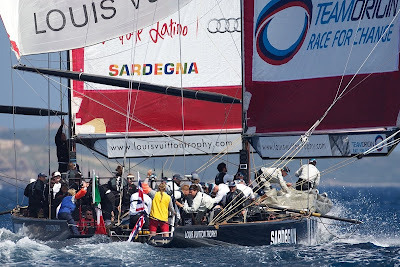 Mascalzone Latino Audi Team vs. Synergy, © Paul Todd/outsideimages.co.nz/Louis Vuitton Trophy. The second race start was a mirror of the first with the Italians making an excellent start at speed while the Russians were still coming up to speed. Jablonski, to leeward, tacked early to clear his air but Brady tacked ahead of him, making the most of a persistent right shift that allowed the Italians to extend. Race Day 13. Quarter Finals: Mascalzone Latino Audi Team (ITA) vs Synergy, © Bob Grieser/outsideimages.co.nz/Louis Vuitton Trophy. Protests from both contestants were green-flagged in this rough and tumble start in 12-14 knots of wind. In the second, late in the prestart, Jablonski on starboard luffed Brady up, forcing him to tack. The Russian boat bore off to make a perfectly timed start at the pin while the Italians made two down-speed tacks to struggle off the line at the committee. The Russians were quickly out to a 105 metre lead, lifted up to the port tack layline on a big left shift and continued to sail away. 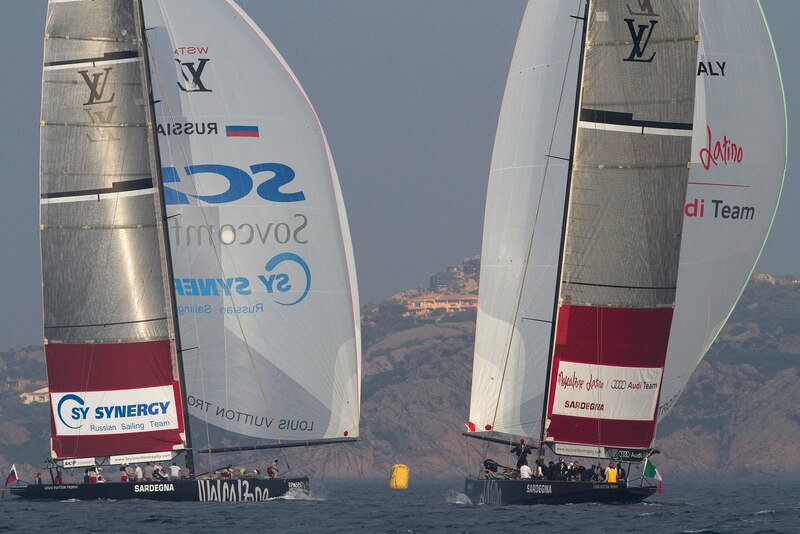 Quarter-final One: SYNERGY Russian Sailing Team, 2; Mascalzone Latino, 1. The shore-side programme for Cowes Week 2010 is set to provide the perfect complement to a packed racing schedule and guarantee the usual vibrant, festival atmosphere ashore for which Cowes Week is so well known. Cowes Week Limited (CWL) is delighted to confirm that the spectacular annual Cowes Week fireworks display has been secured for 2010 thanks to a generous anonymous donor. The display will take place on Friday 6 August at 21:30. The sensational Cowes Week Red Arrows display, a regular fixture in recent years, will take place at 19:30 on Friday 6 August thanks to sponsorship by Artemis Investment Management for the second year running. The display will serve as a perfect warm-up to the fireworks. Monday 2 August will be a day when efforts are focused on the activities of the official charity with an emphasis on fundraising and generating awareness of the charity’s great work. A celebration of women in sailing - one of very few mainstream sports where men and women compete on equal terms – will take place on Wednesday 4 August. A whole host of fun and celebratory activities will provide a focus for the day. § A dedicated area for Cowes Week participants and friends at Shepards Wharf Marina will host daily live bands, crew parties and themed nights throughout the week. Entrance to the site is free, although Competitor Cards may be required at certain times. The late night crew bar is open until 02:00 and entry to Infernos Nightclub is free with a Competitor Card before 22:00 throughout the week (except Friday 6 August). § A lively party atmosphere in the centre of Cowes at Cowes Yacht Haven where live acts will perform on The Gill Stage from 16:00 until late. Entrance this year will be free to all (excluding Fireworks night). § The chance to mingle with the two America’s Cup teams, TEAMORIGIN and BMWORACLE Racing at The 1851 Cup Village on Cowes Parade. Here, you will also be able to watch the Cowes Week racing fleets as they head to and from their start and finish lines and enjoy live entertainment throughout the week. § The Egypt Point race village, will welcome Cowes Week participants and the general public to enjoy the great entertainment of the Extreme Sailing Series racing close to shore each afternoon, while enjoying a relaxed drink, food, commentary and music. § A buzzing town throughout the week with street theatre and live entertainments, provided courtesy of Cowes Business Association. Synergy Russian Sailing Team defeated Mascalzone Latino Audi Team 2-1 to progress to the Semi-Finals in La Maddalena, along with ALL4ONE and Artemis. Racing may still take place between Emirates Team New Zealand and Azzurra to decide the final place in the semis. The Round Robin was finally completed today. The Quarter finals were set to take place today, holding them in order of ranking so if there was a lack of time to complete them all then the event could still move on to Semi-Finals tomorrow. Two races were sailed and the scoreso far is one all in a best of 3 series so one more race to be sailed - the race committe intend to try to sail this race before sunset tonight. If this is not achieved then the first race will count so Synergy will move forward to the semi-finals. If there is not time to complete QF3 and 4, the top ranked two teams move to the semi finals and lower ranked two sail off against each other - the intention is to race 5th to 8th places race-offs tomorrow. ALL4ONE wins the Round Robin in La Maddalena, after a fantastic and well-deserved victory for the French-German team over Artemis in the last match of the Round Robin. Artemis had a good start ahead of ALL4ONE on the right side of the race course, and dominated the first part of the match until the downwind mark. ALL4ONE kept on fighting hard, trying to remain as close as possible in order to create an opportunity to come back on Artemis. ALL4ONE then started a tacking duel in the second half of the second upwind leg, which made it possible for the French-German team to take control of the race just before rounding the last upwind mark. ALL4ONE finally controlled Artemis in the last leg downwind, and crossed the finish line 15 seconds ahead. The competition resumes this afternoon. It was one of the better sailing days we've had here in La Maddalena. Just as Chris Bedford who provides the weather forecast for ARTEMIS predicted, the wind started to build mid-morning. In the first race of the day, Emirates Team New Zealand were spot on with their timing for the pin end at the start and Mascalzone Latino were over the line early. Both teams sailed a good race, but there was no contest and the Kiwis put another point on the board to tie with ARTEMIS. Next up was our race against ALL4ONE who had 5 wins to date. So this was an important one for us as a win for ALL4ONE would mean they would move into first overall. Jochen Schumann's Franco-German team have been steadily moving up the leader board this event so we knew that this would be a close race. We had an excellent start, winning the right hand side and maintained our lead for two-thirds of the race. As we sailed up the second windward leg, both boats were on port tack with ARTEMIS to windward with a 2 length lead. The wind was going right as we sailed side by side and in fact, had gone 20 degrees right when ALL4ONE decided to tack onto starboard. I made the call to tack on them and keep the left, thinking the wind would come back to the left following the big right shift. But the pressure was better on the right and they overtook us. Essentially, my bad decision gave ALL4ONE the race right there as they crossed us at the next intersection and built their lead to finish 15 seconds ahead. That's life as the tactician...big calls that have a big effect on the outcome. The event now moves into the quarter finals. Next up is Synergy vs Mascalzone Latino for the best two out of three races, followed by Emirates Team New Zealand vs AZZURRA. Time permitting, ARTEMIS will race TeamOrigin after these matches. It's shaping up to be another long day. The world’s most elite match racers will converge on the developing region of Gyeonggi in South Korea next week for Korea Match Cup, Stage 3 of the ISAF World Match Racing Tour (WMRT). Twelve helms will take to the tidal flats of Jeongok and Jebu lying on the West coast to fight for further valuable World Match Racing Tour score points. This is the first of the 2010 tour events to be staged outside of Europe and will provide a new developed Asian marine arena for the highly competitive teams. As well as the skippers ranked 1st and 2nd in the overall standings - Mathieu Richard (FRA) French Match Racing Team and Adam Minoprio (NZL) ETNZ/BlackMatch Racing – there will be the addition of Francesco Bruni (ITA) Azzurra, back from the LV Trophy racing, as well as 2009 Korea Match Cup winner Paolo Cian (ITA) Team Italia. New names to the race circuit picture selected via wild card entries include; twenty three year old Phil Robertson (NZL) WAKA Racing winner of the recent Asian Match Racing Championship and Korean national Gunwoo Park (KOR) who only started match racing during November 2009. Spectators get a close up view at the Korea Match Cup, © Subzero Images. The pedigree of skippers and teams attending Stage 3 of the World Match Racing Tour is excellent, they will all be hoping for more wind than the lake sailing at Match Race Germany last month. The teams are excited to race KM36 yachts which have been especially commissioned for Korea Match Cup where a light and manoeuvrable model is required for close ‘boat on boat’ handling. Bruni comes straight from racing in Europe without a rest period in between and Minoprio has used his free time since winning Match Race Germany to race in the mainsheet position at yet another match racing event. It will be a daunting time for the wild cards and qualifiers who will need to elevate themselves up to the supreme level of skill associated with the Tour card holders. “It’s great to come back to the Tour series again after the LV Trophy, I feel the more racing a skipper can schedule into their calendar then the better equipped they will be to perform at international events. Match racing comes down to practice, the more you tune your mind into winning and becoming a seamless team, then the more certain you will be to do well and improve as a group”, said Bruni. Peter Gilmour (AUS) YANMAR Racing is also heading to Asia, when asked to comment on the favourite to win Korea Match Cup he looked at the statistics, “All teams are treated equally on the Tour, going into the round robin at Stage 3 we have an 8% chance of winning, as we build through to the quarter-finals and semi-finals those chances increase to 12% and 25% respectively. As the remaining teams hit the finals they have a 50% chance of winning however, this analysis is affected by each team’s performance and skill set”. With the change in time clocks for the majority of the entered teams and a totally alternative set of race course elements, Korea may provide some surprise results early on in the regatta. Park, the only Korean skipper entered, is excited to meet and race against the world’s crème de la crème of match racing. “I am really proud to be able to race against America’s Cup level teams, I hope I can learn from their skills and perhaps win some races against the less experienced helms”. A crowd of 30,000 enjoy a free concert celebrating the opening of the Korea Match Cup, © Subzero Images. Korea Match Cup racing will start on June 9th, culminating in a closing ceremony and a Stage 3 champion on June 13th. All eyes will be on any notable changes to the WMRT standings after Stage 3. After a couple hours delay waiting for the wind to fill in, the sea breeze finally graced us with its presence and we had five great races to start the Boat US Santa Maria Cup. We finished a very hot day of sailing 5-0, and have four more races tomorrow to finish the first round. Our team sailed very well today, leading at every mark. It was a bit tricky with the current and the wind, but the girls up front did a great job of figuring it out and telling us where to go. At the beginning of the day, we had a couple of pre-starts that ended up upwind of the line for a while as the current dragged us up there in dial ups. It was a little unnerving but great practice for our world championships which will be sailed in similar current. There are ten teams racing from four countries. Other teams that did well today are Sally Barkow (USA) 5-0, Claire Leroy (FRA) 4-1, Genny Tulloch (USA) 4-1. Before we even got to the club, Molly and I had a great workout with Harry, Annapolis Sailing Fitness. We met Harry at the gym at 6:30 am and worked our legs and abs hard. It felt good to get in a good workout before the day of sailing, especially as it turned out to be so hot on the water. Tomorrow morning we will be back at 6:30am for more. Then we will head to the yacht club for an 8am briefing and a 9am start. The forecast for tomorrow is for a bit better breeze but thunderstorms. We're hoping that the storms hold off until we are finished racing. Rolex Middle Sea Race Start. Image copyright Rolex/Kurt Arrigo. 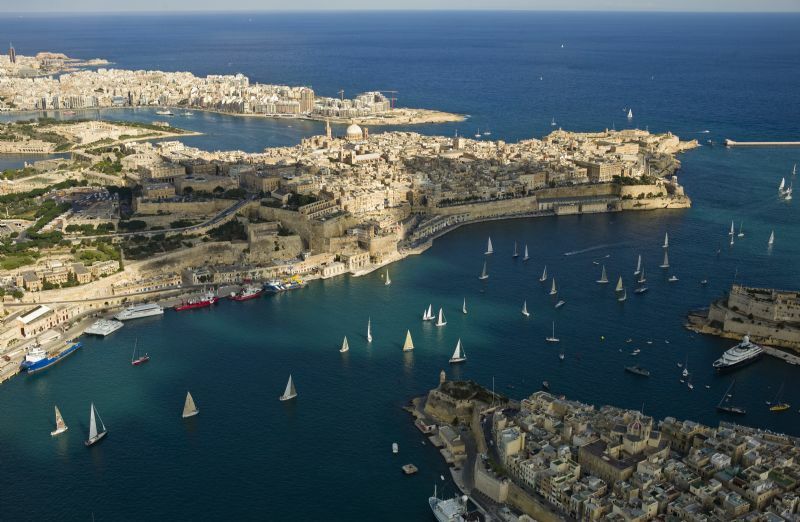 The Rolex Middle Sea Race heads towards its 31st edition in great health. In recent years the 606 nautical mile race has seen a consistency in entry levels that seemed inconceivable, ten years ago. Not just are numbers good, the quality is excellent and the international contingent a key contributor. Throw into the mix that the Royal Malta Yacht Club has moved into new, modern premises and put the showpiece start into one of the world’s showpiece arenas – Grand Harbour – and there seems little doubt that this classic offshore test will continue to move from strength to strength. The 2010 Rolex Middle Sea Race starts in a little under five months time on 23 October. Unsurprisingly, entries have already begun to arrive in the Royal Malta Yacht Club’s mailbox. The current entry list has competitors from the USA, the UK, Italy, The Netherlands, Germany and, of course, Malta. Whilst some eyes may be on the movements of last year’s overall winner, Andres Soriano, to see if he returns with his Mills 68 Alegre (GBR) to defend his hard won crown, an equal number will be watching Mike Slade and ICAP Leopard (GBR) to see if they will return for another stab at the course record that narrowly eluded them last year. Neither has yet been drawn on their intentions for this year. Of course, though, there is more to headline grabbers with this race. INTERMATICA VO70, Lorenzo Bodini. Image copyright Rolex/Kurt Arrigo. Peter Isler is another renowned navigator who has attempted the challenge. In his case, back in 2007, and he has acknowledged the tricky nature of the racetrack, “the course has a lot of opportunities for tactical decisions and local knowledge. The race is set up for someone who has done it before. You could build up a lot of local knowledge…I aim to talk to someone who has done the race before about how to get up through the Straits, playing the currents there and the winds at the various turning marks. It'll be fun though. I love a highly tactical race with a lot of challenges. Some of those with local knowledge already have their preparation well in hand. Jonas Diamantino from Malta aims to embark on his tenth race. Last year Diamantino was third in his IRC class and finished twenty-second overall with Comanche Raider II Gasan Mamo Insurance. Another local Maltese crew looking ahead is Jonathon Gambin and Ton Ton Surfside. This will be Gambin’s fourth race. Last year he suffered the frustration of retiring on the first night with rig trouble following some heavy conditions that eventually put paid to a number of other yachts. “We were having a really good race [and] were at the front of our class. We had seen winds between 25 and 30 knots, and were fast with good boat speed. We needed to free a halyard during a sail change and sent a man up the mast. He spotted a big crack in the starboard spreader. Luckily, we were on port tack. We chose not to risk any more, dropped our sails and retired.” A few hours later Tom Addis’s ride, the STP65 Rosebud, lost her mast. That might seem seriously ambitious. But the Maltese have a history of winning this race. 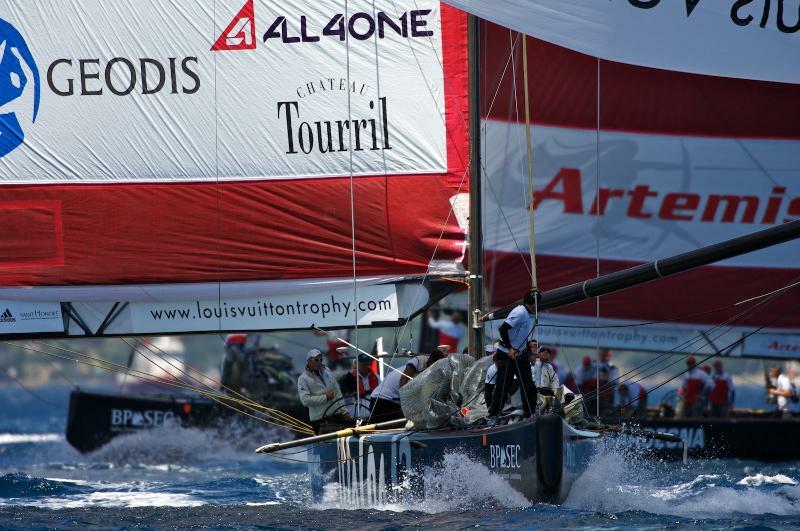 The last time a Maltese yacht won was in 2003, and many think their time is due again. The Rolex Middle Sea Race commences on Saturday, 23 October 2010. Entries close on 15 October. The final prize giving is on Saturday, 30 October 2009. George David's Rambler established the current Course Record of 47 hours 55 minutes and 3 seconds in 2007. NZL Sailing Team. Supplied image. The Governor General, sponsors and friends of Yachting New Zealand were today introduced to members of the NZL Sailing Team at a team launch in Auckland. Those attending also watched as the names of two new Elliot 6 metre Women’s match racing yachts were revealed. 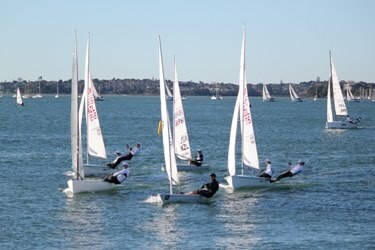 The NZL Sailing Team includes New Zealand’s top tier Olympic campaigners with their sights firmly set on Weymouth 2012 which is now just two years away. The current members have proven themselves as this country’s key prospects for Olympic sailing medals as we count down the next Games. National qualification and Olympic Team selection takes place in the months leading up to the Olympic Games and there is still room for others to prove themselves before then. Elliott 6 metres. Supplied image. Two of New Zealand’s legendary women sailors have been honoured with the naming of Yachting New Zealand’s new Elliott 6 metre Women’s match racing yachts. Today New Zealand’s Governor General officially named the yachts Barbara Kendall and Leslie Egnot in front of a crowd of sailors, sponsors, media and friends of Yachting New Zealand. The names were chosen after a nationwide competition where yacht club members submitted their suggestions to a panel of judges for their consideration. The winning entry came from Freerk Kempkers of Waikawa Boating Club in Picton. His Royal Highness Crown Prince Frederik will steer 17 during the fleet race, alongside James Spithill and John Kostecki. 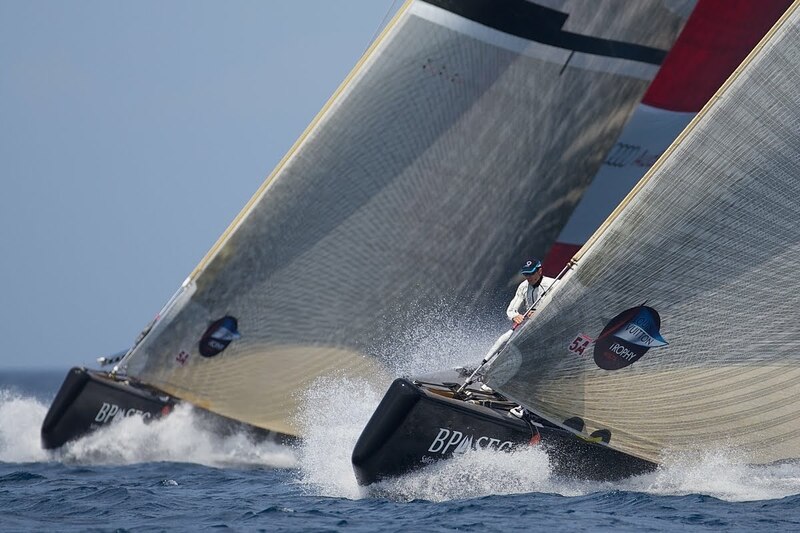 Image copyright GEPA / Ralph Martin Fisher / RC44 Class. 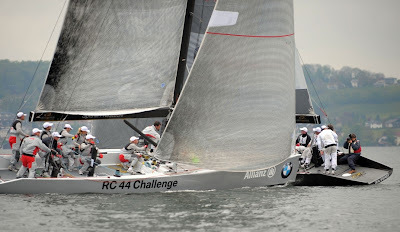 Copenhagen will host the third regatta of the RC 44 Championship Tour 2010 on June 8 – 13. Organised by the Royal Danish Yacht Club, the event will bring together ten RC 44 one-designs for a week of fleet and match racing. Winner of last year’s Championship Tour and current leader of the overall ranking, Pieter Heerema and his Team No Way Back will be the RC 44 Copenhagen Cup “home team”. Despite sailing under the Dutch flag, No Way Back is the only RC 44 who already sailed in the Baltic Sea. Indeed Pieter Heerema and his crew test-sailed their boat in Denmark for the first time during the winter 2008-09; a practice session that paid off and allowed the Dutch team to immediately compete for the top spots. James Spithill will also benefit from local advice thanks to His Royal Highness Crown Prince Frederik, who will steer 17 – that’s the name of the boat – during the fleet race. Crown Prince Frederik is a keen sailor, a competitive Farr 40 skipper as well as an accomplished Dragon sailor. The teams involved in the RC 44 Copenhagen Cup are the same as the ones involved in last month’s Austria Cup, with Jes Gram Hansen making a come back on the circuit as pro helmsman on board of Team Sea Dubai. 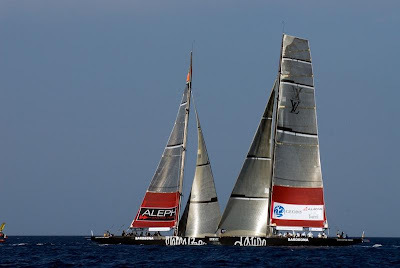 After Copenhagen, the RC 44 Championship Tour 2010 will carry on in Valencia (SPA) in July and the Canary Islands in October for the first ever official RC 44 World Championship. The RC 44 fleet will then be shipped to the US, also for the first time, and will compete for the Oracle RC 44 Cup Miami in December. ALL4ONE wins its match against Aleph today in La Maddalena. Racing started late in the day, as the race committee had to wait that the wind would finally go down to launch the matches. The French-German team still competes for the semi-finals, and also for the first place of the Round Robin. The final answer will come out tomorrow morning with the two last races to finish the Round Robin: Mascalzone Latino vs Emirates Team New Zealand, and ALL4ONE vs Artemis. With 17-18 knots of wind, ALL4ONE had a good start by taking the advantage on the right of the race course. ALL4ONE extended its lead on the first upwind leg, and protected the right hand side thanks to good tactics and a good boat handling. 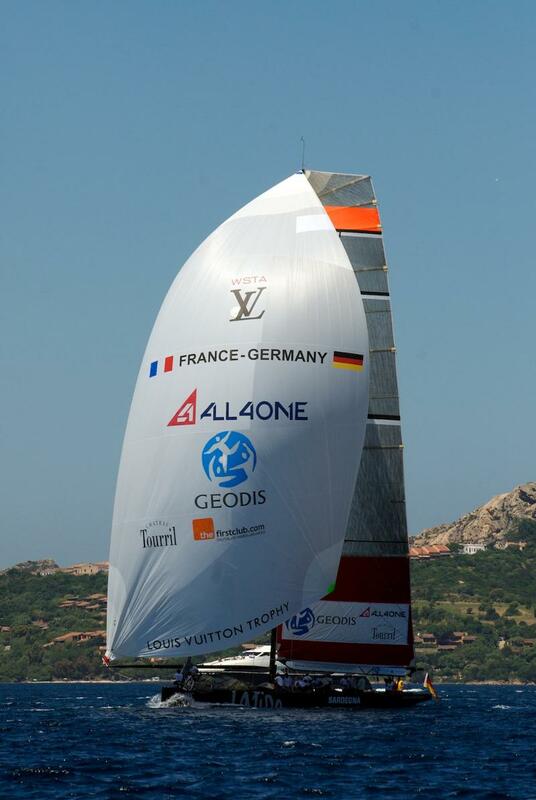 The French-German team rounded the first mark 14 seconds ahead, and kept the same advantage until the downwind mark. Then ALL4ONE extended even more on the second upwind beat to round the third and last mark 27 seconds ahead, and crossed the finish line first to win the point. Philippe Mourniac, Navigator: " It was a tough race as there was a lot of wind. The key point is that we managed to take control from the start, and then to keep it. But these are never easy races, as anything can happen in these strong winds, like a technical problem or a bad manoeuvre, so we had to remain very concentrated on board. We are now very motivated for tomorrow and our last Round Robin race against Artemis." John Cutler, Tactician: "Sebastien did a nice job getting the side of the course we wanted, and we were pleased that the right hand side was the correct choice. It was also a matter of not having too many damages or problems in the strong wind today. Generally it was nice to get that point. Tomorrow is now a big day for us." Last match to race tomorrow morning for ALL4ONE against Artemis to conclude the Round Robin! TEAMORIGIN vs Mascalzone Latino Audi Team. Image copyright Ian Roman/TEAMORIGIN. A spinnaker drop error led to a crucial race loss for TEAMORIGIN against the Italian Mascalzone Latino team. Their fate in the competition now awaits the results of the remaining round robin races still to be completed and the quarter final format to be finalised. TEAMORIGIN trimmer Mike Mottl suffered a leg injury during the manoeuvre and had to be taken to hospital for an x-ray for which we are currently awaiting results. A six-hour delay to racing on Wednesday due to strong winds was the preamble to the last race for TEAMORIGIN in the Round Robin stage of the Louis Vuitton Trophy La Maddalena. The last of the three Italian teams, Mascalzone Latino, was the opponent for today. 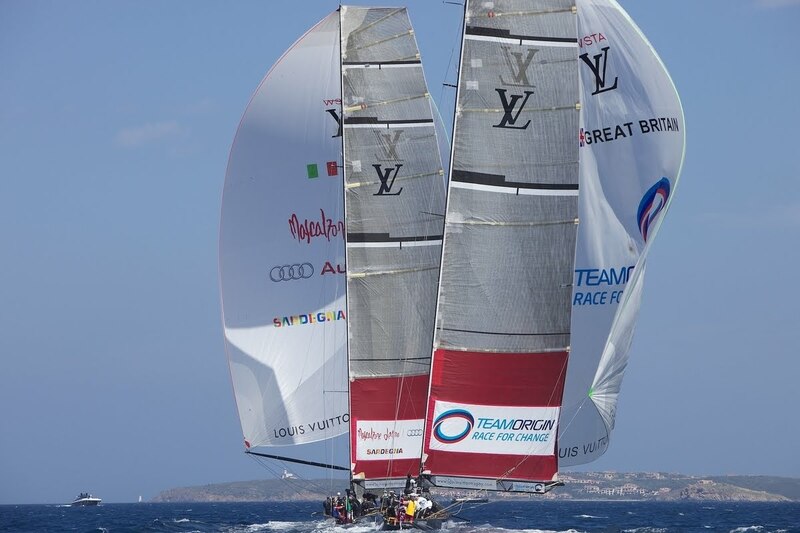 TEAMORIGIN had drawn the starboard entry in the blustery conditions and roared into the start box to begin the complex pre-start engagement of the Italian team. Two long dial-ups burned up the first three minutes of the countdown before the pair broke off and Mascalzone harried the British team above the line and around the committee boat before the skipper Ben Ainslie led the pair back to the seemingly favoured left hand end of the line. In the last manoeuvre, Mascalzone misjudged their timing leaving TEAMORIGIN a length and a half clear as the pair cleared the start line after the gun. The next three minutes proved to be a crucial part of the race. With TEAMORIGIN ahead and to leeward and Mascalzone to windward and slightly behind, a steady wind would normally have seen the British boat in command of the situation. The wind however started to shift to the right and the weather boat was able to live in the unfavoured position and eventually gain sufficient lateral separation to pin TEAMORIGIN out. So as not to fall into the same trap as a similar situation in the race against Azzurra yesterday, the TEAMORIGIN afterguard decided to cut their losses and engage early in a tacking duel and try and force an error on the leading boat. Following the exchange of several tacks the pair found themselves set up, or so they thought, on the port tack layline to the weather mark, Mascalzone ahead by three lengths and TEAMORIGIN a couple of lengths to windward. On approaching the mark it became clear that Mascalzone was not going to lay the mark and had to perform two late tacks, whilst TEAMORIGIN was able to shoot the mark. The result was the Italian boat leading around the top mark by just 10 seconds. On the run the trailing boat usually has the ability to dictate the tactics. TEAMORIGIN sailed hard down inside the leading Italian boat and when the time came to gybe for the gate was in a strong position overlapped to leeward and in a position after the gybe to roll through and claim the inside berth for the favoured buoy at the bottom. Mascalzone set up for the other buoy and at the turn TEAMORIGIN had re-taken the lead. However, the boat handling manoeuvres on board the British boat had been compromised earlier due to a failure of the string drop mechanism for the spinnaker take-down. The crew of TEAMORIGIN were therefore obliged to do a manual take down of the 500 square metre spinnaker, the execution of which was not perfect and the sail ended up in the water requiring halyards and sheets to be let go. Unfortunately trimmer Mike Mottl got his foot caught up in the streaming sheet causing him to be dragged towards the block at the back of the boat. Quick reactions on the part of the mainsail trimmer and helmsman stopped the boat and the rest of the crew were able to cut the tangled sheet from Mottl’s leg. The team made a quick recovery but the opposition had not waited and were now back in the lead and more than 130 metres further up the race course. By the time the pair approached the last turn TEAMORIGIN had again reduced the lead but not sufficiently to have any real chance of attacking on the last leg. Mascalzone crossed the finish line 35 seconds ahead. Mottl, in significant pain, was evacuated from the yacht after the finish by the Sardinian security services and taken to the local hospital where results of the x-ray are currently awaited. During today's race against Mascalzone Latino, trimmer Mike Mottl unfortunatel got his foot caught up in the streaming sheet causing him to be dragged towards the block at the back of the boat. Quick reactions on the part of the mainsail trimmer and helmsman stopped the boat and the rest of the crew were able to cut the tangled sheet from Mottl’s leg. Following x-rays and scans at the local La Maddalena hospital, Mike was give the all clear to head back to his hotel. He has suffered muscular damage and will not be sailing any further races during this regatta to allow him the time to make a full recovery.